Born in South Wales, Lezley joined the entertainment industry in 1994. Starting off as a resident 'Coat Style' entertainer on holiday parks, Lezley learned much about the entertainment industry and gained a confidence when performing live, which she believes could only come from experiences such as these, experiences that mean she is able to easily form a rapport with almost any audience. Following Lezley's final summer season, she became a singer with several bands, touring all over the UK and performing residency contracts in the UK and overseas. Some of Lezley's favourites include Le Royal Meridien in Bahrain (now the Ritz Carlton), Hyatt Regency La Manga in Spain and Grand Hyatt Muscat in Oman. In recent years Lezley has been flying solo and can regularly be seen in various parts of the UK performing as a self contained cabaret artist. As well as singing, Lezley has recorded jingles (both sung and spoken), adverts and various other things including story narration. Over the years, Lezley has been fortunate enough to perform in front of some great and well known people. 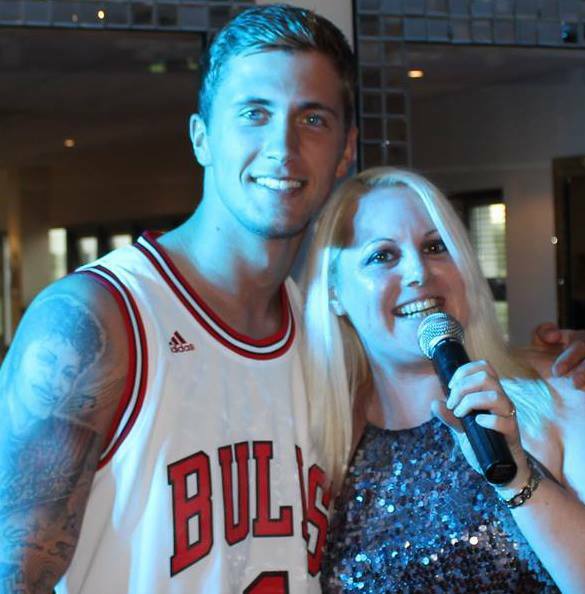 As well as performing by request at Lord Stirling's 65th birthday party in La Manga (Murcia, Spain) and at the official winners party for the Qatar Superbikes Championship in Doha, Lezley has also had the pleasure of having in her audience, amongst others, 'The Only Way Is Essex' cast member Dan Osborne, the Croatian National Football Team, British football clubs Leicester City FC, Coventry City FC and Lezley's favourites Newcastle United, including Alan Shearer and the late, greats Gary Speed and Sir Bobby Robson, Hollywood actor Jeff Goldblum, writer and comedian Rory McGrath, one half of comedy double act 'Hale & Pace' Norman Pace, journalist and TV presenter Piers Morgan, famous Irish group 'The Commitments', the Prime Minister of Bahrain, and good friend, Rock Legend, the late Stuart Cable of The Stereophonics. Lezley pictured above with 'T.O.W.I.E.' 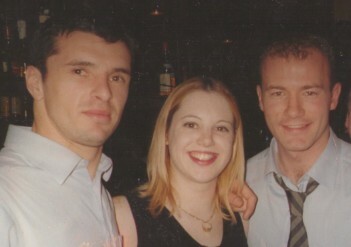 hunk Dan Osborne at a charity football event and below back in 2000 with Gary Speed & Alan Shearer after a performance in La Manga. ''Thanks Lezley for helping to make our New Year's Eve function a great success, your experience as a professional singer judged the audience just right. We have received lots of postive comments. Many thanks.'' Mike Johnson, Middleton Hall Golf Club.